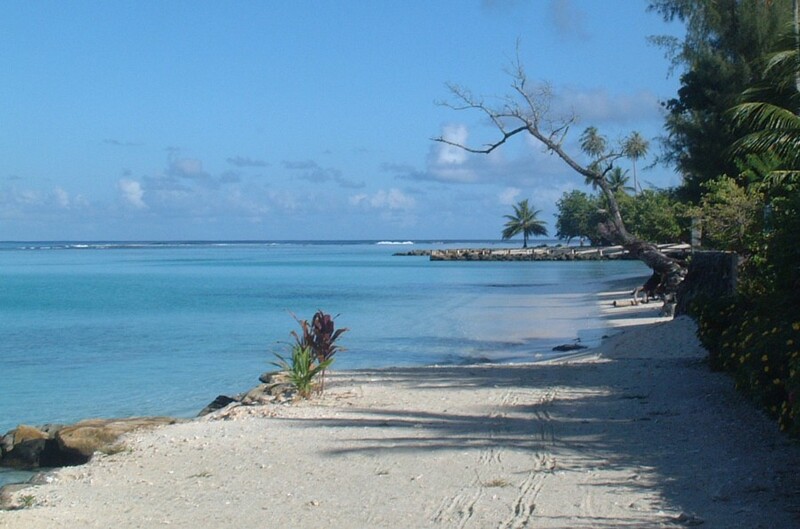 History of Huahine and les Iles Sous le Vent: Captain Cook discovered Huahine and the other Leeward Islands in 1769 - an easy feat, as the Polynesians knew them quite well already. In fact, Huahine had already been settled by Polynesians circa 850. Nonetheless, Cook named the six islands (today the Leeward Islands) the Society Islands. That name was later spread to Tahiti and Moorea as well. 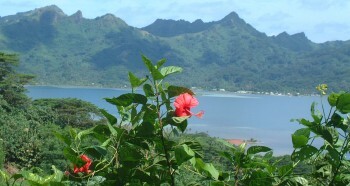 Huahine's economy was greatly boosted throughout the 19th century by American whalers avoiding the Antarctic waters in winter. 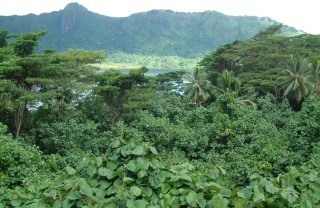 Instead they stayed at islands like Huahine to re-supply with island products, trading foreign plants for hospitality. Today, some of those introduced plants are having adverse impacts on the ecology. Like much of the rest of the Societies, missionaries came to Huahine in 1808. Later, King Pomare II extended his reach to Huahine and abolished the traditional local religion. Missionary law was imposed in 1822. The Leeward Islands (Iles sous le vent) remained a British protectorate until 1887, 45 years longer than Tahiti and Moorea. 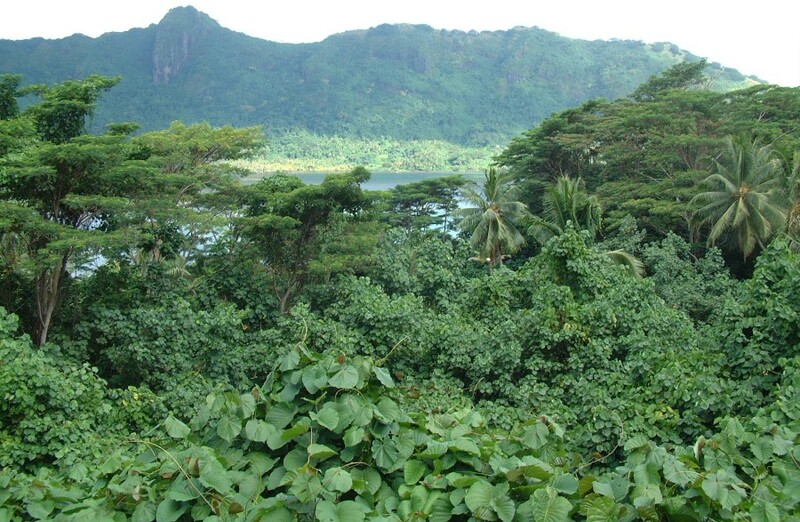 The French landed marines on Huahine in 1886, telling Britain that they wouldn't annex the islands, but a year later Britain traded them for fishing rights off Newfoundland. Still, the French had problems. Most local chiefs refused to sign the treaty until 1895, and Raiatea held out for two more years. An initial act of the French was to expel the English missionaries. Nonetheless, missionary law did not end until 1945, when all the islanders were given French citizenship. 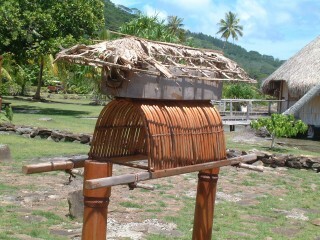 (Sue) This was probably my favorite of the Society Islands. After an overnight passage we arrived on the tranquil island of Huahine and anchored off the tiny 1-street town of Fare, the only village on the whole island. A long beach bordering the town was great for walking and shelling. Because the coastline of Huahine is extremely convoluted, we decided to rent a car to explore the coast that we wouldn't be able to see by boat. What a treat! The road dips and curves offering new views around every corner. The pale blue lagoon sparkles to seaward, and lush green ferns, Tahitian chestnut and rosewood trees tower above the road. The archaeological site, or Marae, at the "village" of Maeva is one of the best restored in all French Polynesia, and we spent several hours there reading the displays and wandering around the stone ruins. A trail led above the Marae to other ruins deep in the forest. We didn't dive here, but the snorkeling was really good on the reef south of town. Even near town, where the water didn't have great visibility we saw many new fish species. (Jon) Huahine is about 90 miles (160 km) from Moorea. This is a bit long for a day-sail where one has to arrive in daylight, and we had Bill & Mary and their kids on board. We'd never subjected our guests to an overnight passage before - It's one of those over-rated pleasures, sort of like sleeping on a beach and getting sand everywhere, or breakfast in bed and getting crumbs all over. But Bill was very keen. So with a full moon and a gentle quartering breeze we set off just at dusk, arriving in the morning after a delightful sail. 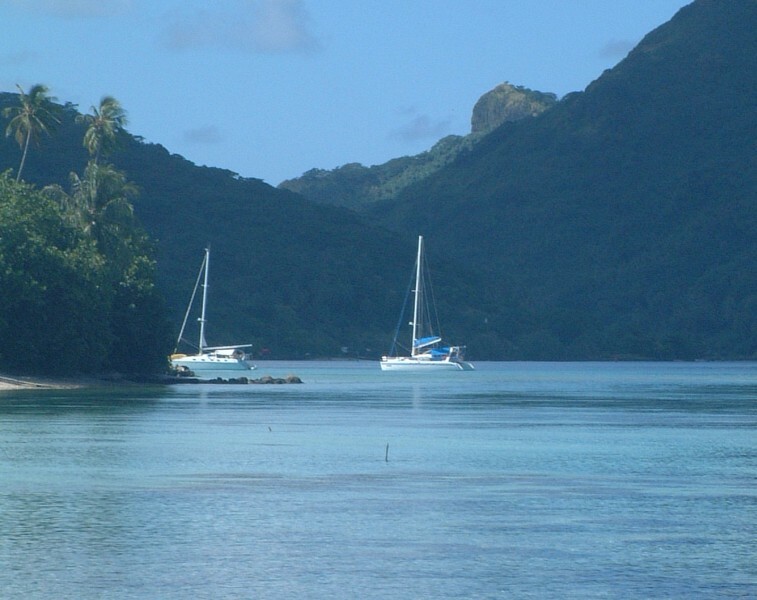 As often happens after an overnight sail, we loved Huahine. Long sand beaches to walk on, nice sandy anchorages on the outer reef, good snorkeling, and clear water. Although the town was small, it had an active and colorful market, and we had a delightful dinner there. We rented cars and toured the island (actually 2 islands, as there is a narrow passage between them), finding several archaeological sites, lush forests, pretty vistas, and a delightful Bed & Breakfast that served wonderful home-made ice cream on their lawn. Bill and I spent a delightful afternoon joy-riding in the dinghy, exploring nooks and crannies and even venturing through to the east side of the island. This involved dodging local kids, who liked to hang out on the bridge and splash the passing dinghies by diving in just next to them. Good fun. Since we'd never been to Huahine before, we moved Ocelot quite a bit, exploring different anchorages and looking for new places to snorkel. For our town anchorage, we preferred anchoring south of town, in between the 2 reef entrances. There was excellent snorkeling there, and fewer flies than off the old hotel. But the whole western reef offered excellent anchorages, with nice snorkeling and exploration possibilities, in isolated splendor. (Chris) We didn't spend a lot of time in Huahine, but I enjoyed it. The most interesting thing was seeing the sacred blue-eyed eels. We'd heard about the eels, which live in fresh water, from our tour info. Since we were touring the island in rental cars, we paid them a visit. I didn't really know what to expect, but I was surprised at how large they were (about 3 ft). They weren't quite like the saltwater morays we see while diving, but were surprisingly similar in body shape and fin structure. It depressed me to see how little water they had, barely enough for a 3" thick eel to move in. The eels live in 'caves' where the cement along the banks of their stream has eroded or been removed. Our tour also included a stop at a pearl farm. This farm was actually based out of a structure built on the water, but a boat took tourists out. Similar to the farms on Fakarava, the pearls are seeded with a sphere of shell from a freshwater oyster and a sliver of mantle from a Tahitian oyster. The oysters are hung deeper here so boats can pass above them, but otherwise it was similar except there was a display case including some very nice large pearls, often set in gold and/or with engravings in the nacre. All very beautiful, but the nicest ones were over $1,000 US. The other major stop on our tour was a marae, which is basically the Society islanders' equivalent of a temple. The marae consisted of a large open space paved with stones (read REALLY HOT) and several small constructions such as altars, tables for offerings, and tombs of important people. This marae, which had been beautifully restored, included many signs explaining different parts in, among other languages, English.